I had the incredible honor of attending tonight’s Newbery Award Party in Salt Lake City. 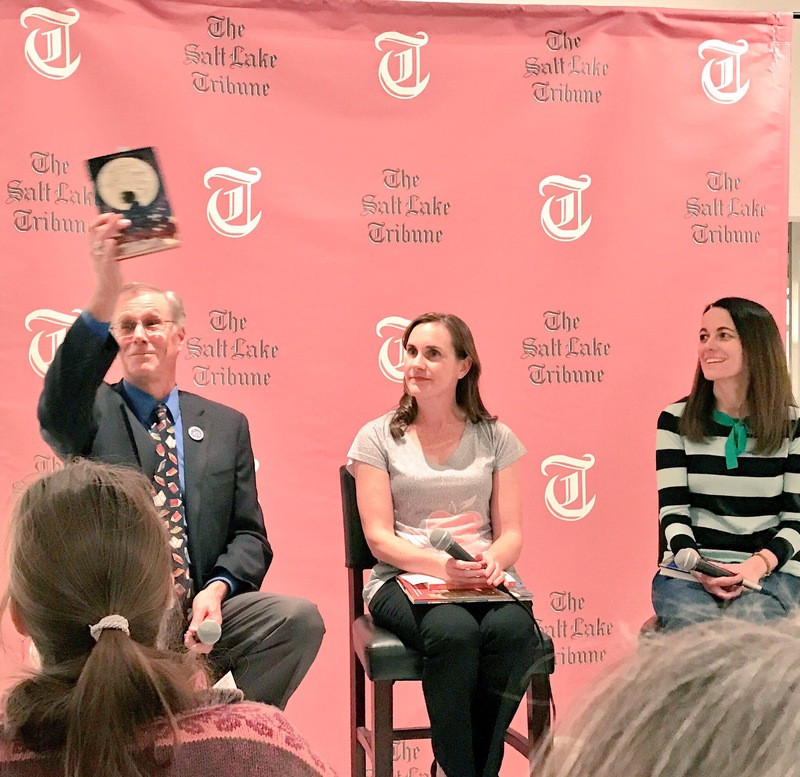 We got to hear from a panel of industry professionals, including local author Ally Condie, associate professor in education psychology at the University of Utah Lauren Liang, and director of the Provo City Library Gene Nelson. We got to learn all about how the committee chooses the winners, how many books they had to read in the past year (over 300! ), and how heated the debate over the top books can get. It was incredibly enlightening and so much fun to learn about. This year’s winner was The Girl Who Drank the Moon, which sounds PHENOMENAL. Check out the details below and be sure to add it to your TBR list if you haven’t read it already! If you’ve read very many of my blog posts, you know I’m a huge supporter of my local authors, and my local indie bookshop, The King’s English. This is because of the incredible book community we have here, which happens to include some of the best YA authors in the business. Ally Condie commented on just why she believes that is, so I wanted to share her thoughts with you. 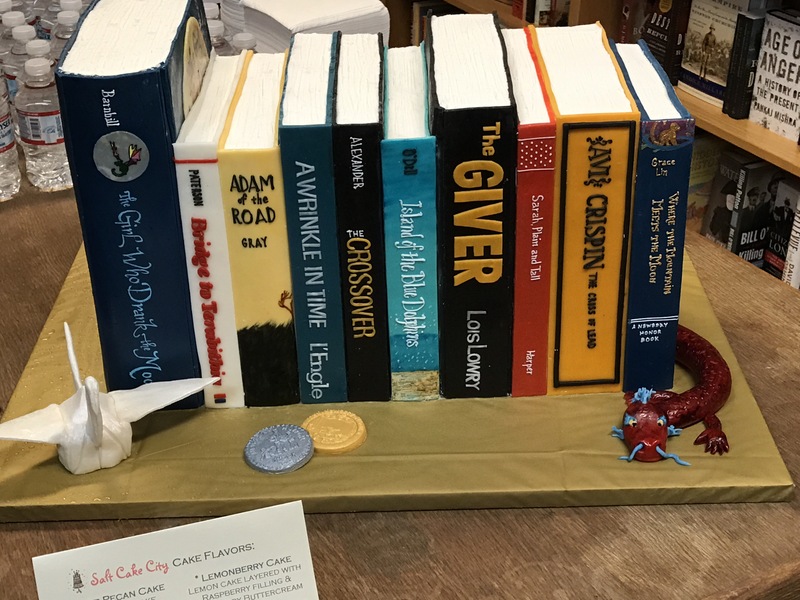 Can’t have a Newbery party without a giant bookstack-shaped cake! Check this thing out! If you’re an adult reader, or aspiring writer, of YA or children’s books, you probably get asked quite frequently why YA? Why children’s books? Why not adult fiction? I could go on and on about my feelings on that subject, but I think Ally Condie sums it up much more eloquently than I ever could here. 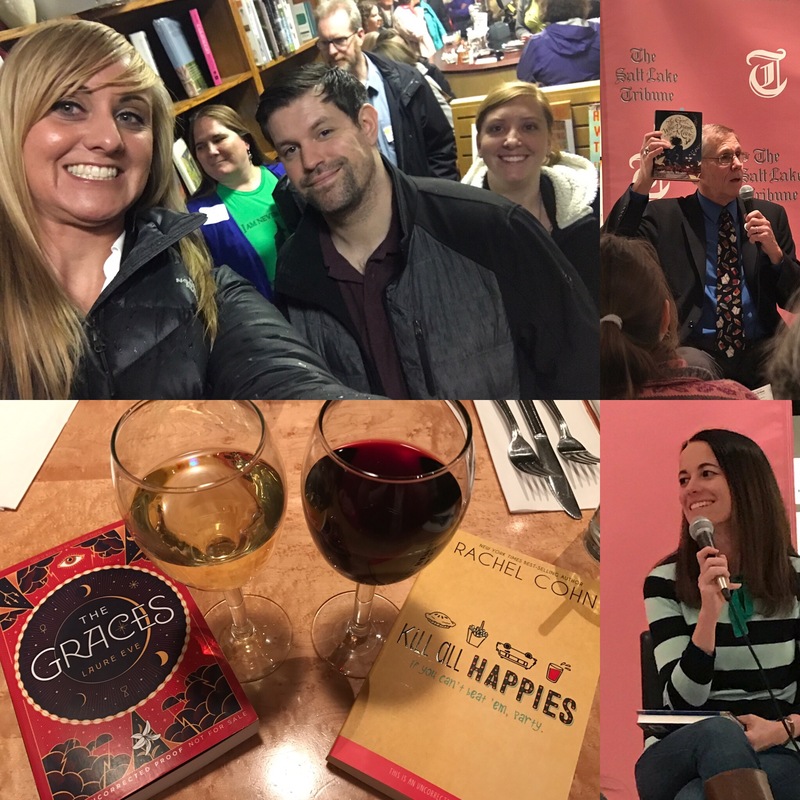 How Do You Top Off a Great Book Event? With a glass of wine, some FAB new books, your book bestie, and your SUPER supportive hubby! Cheers! What Newbery Award winning books have you read? Do you have a favorite Newbery winner or honoree? Did Seeking Mansfield Just Out Swoon Mansfield Park?! I’ve got The Girl Who Drank the Moon on my table right now! I love Xan the Witch, especially her reaction to those crazy people leaving babies everywhere. *lol* I hope to finish it soon after I get more obligation reading done. I actually didn’t eat it TBH. I just admired it. It was too pretty! I can’t wait to hear your thoughts on The Girl Who Drank the Moon when you finish it. I used to be on top of the Newbery winners when I was younger, but now with a YA blog it’s harder, since most of them are children’s or middle grade. That was a cake!?!?!?!?! Whoa. Amazing! Right?! I couldn’t bring myself to eat it. Way too pretty. !!! This is the sort of party I’d love to attend! I read The Girl Who Drank the Moon earlier this year; it is a wonderful book. This is the first time I’ve read a Newbery before it was announced! I feel so special. Wow– that cake! I hope you guys got to try it. 😀 If so, what flavor? That’s awesome that you read it before it was announced! You’re a Newbery hipster. 😉 And yeah, that cake! I couldn’t eat it. Too pretty. We just took lots of pictures.